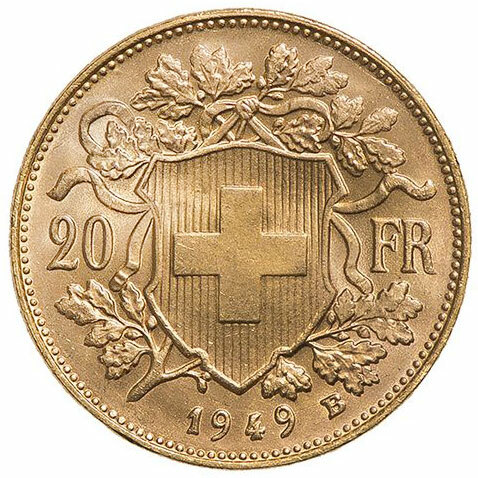 At Gold Avenue, we are honored to present you with the Swiss Gold 20 Francs Coins. These coins are widely popular all over Europe as a collectors coin due to their rich historic value. These coins are been around since the late 19 century, and they are a symbol of Swiss history and culture. This elegant and beautiful Swiss Gold coins features Helvetia, who is the female personification of Switzerland. Designed by Fritz Landry, she is depicted looking into the distance, with the famous Swiss landscape behind her. She is known as the national symbol of Switzerland. We highly advise you to invest in the Gold Swiss Franc Coin due to it’s lower premium price, compared to the price of Gold. This is an ideal coin for investors or collectors on a more modest budget.